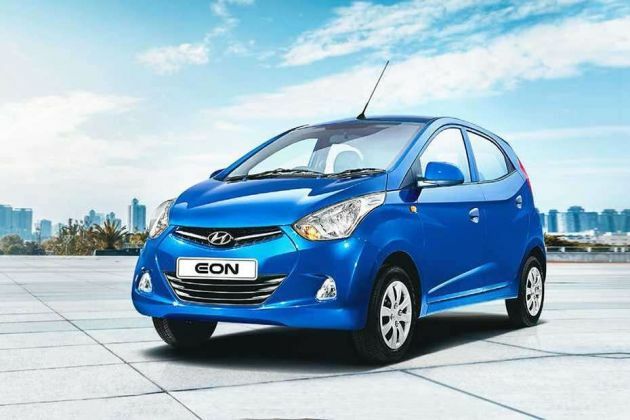 This variant, Hyundai Eon Era Plus is one of the mid level trim in its lineup. Its safety section has been cut down by removing the central locking system, which is a setback. Apart from this, everything else is retained and no additions are made. It incorporates a 0.8-litre, iRDE petrol engine that is based on a SOHC (single overhead cam shaft) and contains 3-cylinders and 9 valves. It has a displacement of 814cc and a power of 55.23bhp along with a torque of 74.53Nm. Mated with a 5-speed manual transmission, this vehicle can be relied for adept performance. Its outer body looks good with chrome application on the front, unique set of tail and head lamps, a trendy spoiler along with other detailing such as body toned bumpers. Inside the compartment, apart from the many storage units like cup and bottle holders, even the pedal space and dashboard have received an exclusive design. Its interior scheme has a two tone scheme, while it also has bucket type seats, which make the cabin appear decent and cozy. For the sake of handling this vehicle efficiently, there are robust tyres as well as disc brakes along with an electric assisted power steering. Safety system has been designed by making a strong foundation of immunity to the very structure itself with reinforcements. It is further addressed by equipping passive as well as active protective features such as seatbelts to front and rear seats, child safety locks to the rear doors and an engine immobilizer too. Aspects such as an air conditioner unit, power windows along with full sized armrests to the front doors and a power outlet for charging gadgets are provided for convenience. Instrument panel is imbibed by notifications of low fuel warning, dual trip meter, gear shift indicator and graphic band fuel gauge. Remote release to fuel lid and tail gate make their way in keeping the driver's job easy. All in all, even after losing a key feature, this trim still stands appealing to choose. Its external appeal has been designed intricately with a lot of impressive elements. The frontage seems to hold all the attention with a chrome based radiator grille. This is further flanked by a pair of clear lens headlamps on either side of this grille. The front as well as the rear bumper are in consent with the body color that adds to its overall looks. Both its windscreens have a tinted film, which minimizes the affect from external light and heat plus avoids the glare of the headlights from other vehicles in the night. Tailgate looks unique and sports a pair of clear lens tail-lamps. And there is an integrated spoiler that gives a trendy appearance to the overall structure. On the inside, the cabin design is based on a two-tone beige and brown color that makes it look quite swish. Its B and C pillar trims can be found inside the compartment. There is a deluxe floor console and it has handy storage within it. The steering wheel has two spokes and the center fascia is given a silver touch. There are speaker grille's on its front doors, while its molded door trims consist of map pockets and bottle holders as well that add to its utility quotient. The exclusive dashboard contains a storage space and there are cup holders as well as a rear parcel tray too, which helps in keeping a few things at hand. Three assist grips can be found above all the doors except the driver's side. The pedestal space also looks attractive with a special design. The rear end has a bench seat which can be folded to accommodate more luggage when required. While both the front ones are bucked type single unit seats. The seating seems quite comfortable and can accommodate a maximum of five occupants. It is equipped with a 0.8 litre iRDE petrol engine which has a displacement capacity of 814cc. Its 3 cylinders and nine valves are arranged based on a single overhead camshaft valve train system. It can produce a power of 55.23bhp at a range of 5,500rpm and also generates a peak torque output of about 74.53Nm at 4,000rpm. It is skilfully coupled by a proficient 5-speed manual transmission gear box, which ensures smoother gear shifts. The front axle has been equipped with a McPherson strut, while the rear axle is affixed by a torsion beam to balance this vehicle on any terrain. On the other hand, we find disc brakes affixed to its front wheels and the standard set of drum brakes to its rear wheels. A set of 145/80 sized tubeless tyres are fixed to its 12-inch steel wheels along with a spare tyre equipped in the boot compartment. Quite a number of aspects have been taken care of by the manufacturers in regard to this variant. Starting from the armrests to the front doors which are of full size to the power socket that enables to charge small electronic devices, this trim is incorporated with many utilities. Power windows have been integrated to the front doors. Electric power steering will allow an effortless drive and adding to the convenience, the driver is offered with electrically released fuel lid opener and tail gate release. An air-conditioner unit is offered for the regulation of the cabin temperature with well placed vents. A dual trip meter, graphic band fuel guage, gear shift indicator and low fuel warning form a part of the notifications embedded in the instrument panel. Rear seatbelts have knuckle holders to them. Only one change has been made to this trim, which is a disadvantage as its central locking system has been removed. Other standard aspects remain the same. Reinforced body structure stands guard against external impacts that would arise in the case of a crash or collision. Front as well as rear seats have seatbelts. Child safety locks have been integrated to the rear doors. A feature that immobilizes the engine on detecting any unauthorized access to the car has been incorporated for additional protection against theft. 1. Comfort section is well equipped. 2. Exteriors are quite appealing. 1. Central locking system should be retained. 2. Boot compartment is too small.